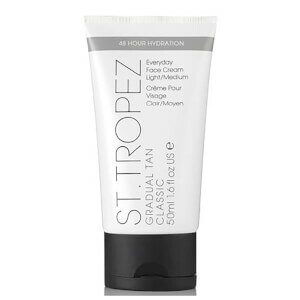 St. Tropez's Gradual Tan Classic Face Lotion adds a hint of radiance to your complexion without clogging pores. Its ultra-hydrating formula combines Vitamin E and Hyaluronic Acid to moisturise, soften and protect skin, whilst delivering sun-kissed colour with a natural-looking finish. Suitable for sensitive skin and all skin tones, the quick-drying, lightweight moisturiser gradually builds to create a streak-free tan, whilst innovative Aromaguard™ Fragrance Technology banishes the unpleasant self tan smell. Re-apply daily to build your desired depth of tan, or use as a smooth make-up base. E.N. Aqua (Water), Isononyl Isononanoate, Dihydroxyacetone, Glycerin, Cyclopentasiloxane, Hydroxyethyl Acrylate/Sodium Acryloyldimethyl Taurate Copolymer, Glyceryl Stearate, PEG-100 Stearate, Cyclohexasiloxane, Ethoxydiglycol, Steareth-21, Phenoxyethanol, Saccharide Isomerate, Caprylyl Glycol, Steareth-2, Parfum (Fragrance), Polysorbate 60, Sorbitan Isostearate, Pentaerythrityl Tetra-Di-t-Butyl Hydroxyhydrocinnamate, Hydrolyzed Hyaluronic Acid, Tocopheryl Acetate, Linalool, Hexyl Cinnamal, Benzyl Salicylate, Butylphenyl Methylpropional, Citronellol, Citric Acid, Sodium Citrate, Limonene, Geraniol, Hydroxycitronellal, Alpha-Isomethyl Ionone.